Learn the Flowers CSA is in its 6th distribution week! The weather this morning really reminded me of how chilly some August mornings can be. The dew on my shirt sleeves and legs combined with the cool morning air made me shiver as I walked through the field. I’m certainly not complaining about the refreshing August morning air, but around this time of year, a few brisk days in a row can be a bit shocking to the body! Today was particularly cool too, as there were rain clouds bumping up against one another in the sky later in the morning. The fairly consistent appearance of rain this summer has been a huge gift as a farmer and really helped us in our pursuit of healthy plant growth. It’s easy enough to irrigate our multiple fields and hoop houses but there’s nothing quite like the refreshing drink of a good rain. Eustoma or Lisianthus- (pronounced Li-see-an-this) White, creamy yellow and/or pink bloom, slightly resembling a rose-shape. This week’s journal will focus on dahlias, red leaf hibiscus (foliage) and ruby silk grass. 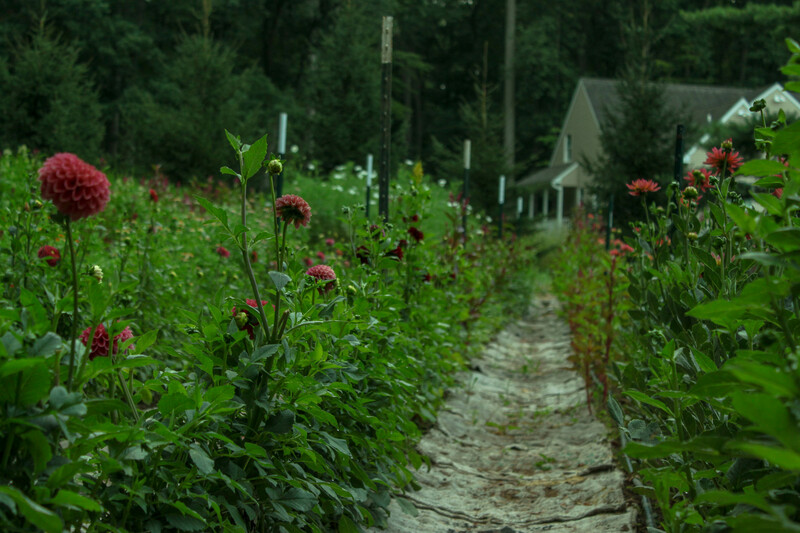 So this is a limited view of some our dahlia beds. I wish there was a way to capture a good photo of the seven or eight long rows of dahlias, neatly trellised and currently weed-free. I think I would need to stand on a very tall ladder in order to get the most inclusive perspective to capture it all. This is the first season that we are growing this amount and in this particular field. It’s a bit of an experiment and we’ll see how it turns out by the end of the season. Dahlias are some of the most extravagant-looking, unique and colorful flowers to grow. They can range in size from little 2-inch heads to heads that are a foot in diameter known as dinnerplate dahlias. For these reasons, dahlias are some of my favorite flowers to grow! They are also some of the most work intensive. Dahlias grow from tubers and can be planted out in the spring after all threat of frost has passed. They need 15-18 inches-worth of space apart because their large-leafed foliage can really spread out and get quite bushy. Once they’ve burst through the ground and start to get some height, they need to be stabilized with some form of trellising in order to keep the heavy plant standing up straight in order to produce straight stems. In past years we’ve used a couple different methods and this season I am doing multiple layers of “stake and weave” trellising (a popular method mostly used to trellis tomatoes) using strong string and twine, supported by metal stakes placed 7-8 ft apart down the row. So far this seems to be working sufficiently. At the end of the season, all the dahlia tubers must be dug up, dirt shaken off to avoid rot, and stored where they will not freeze or rot over the winter. This is one of the main reasons they are so work intensive! They are like a perennial that has to be dug up and re-planted each season. 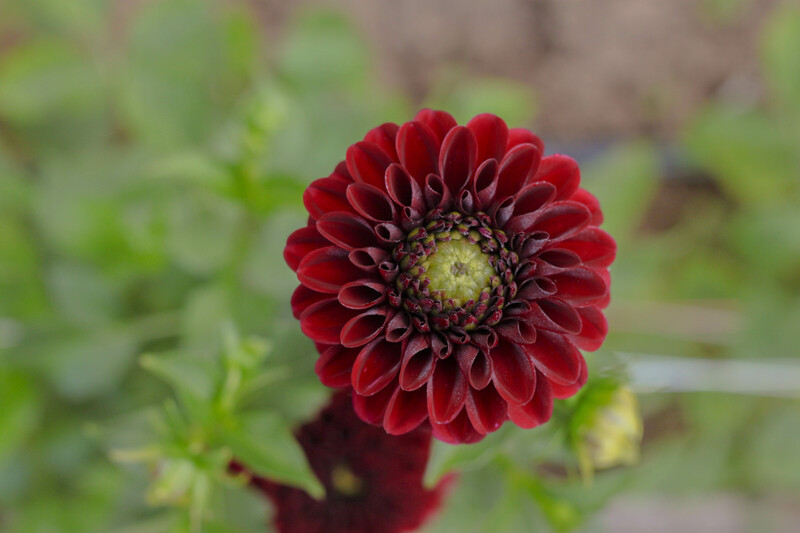 There are also some varieties such as the “Karma Dahlia” which has its own patent (and can not legally be re-produced) and is not sold as a tuber but as a plug with roots that can be transplanted in the spring and will bloom in the summer. One of the dinnerplate varieties of dahlia that is extremely popular with floral designers and brides is the Cafe-au-lait dahlia. It is big and beautiful and varies in muted pink, purple, and caramel hues. Flower farmers across the country right now are trying to grow and have scrambled to get their hands on these tubers because they’re so popular. One of my new favorite varieties that we are growing this year is a single-flowered type of dahlia and has a yellow center with a small single ring of white or maroon petals surrounding the center. It has a small 2-inch head and is so perfect that I want to eat it like the flower teacup that Willy Wonka eats in the movie. 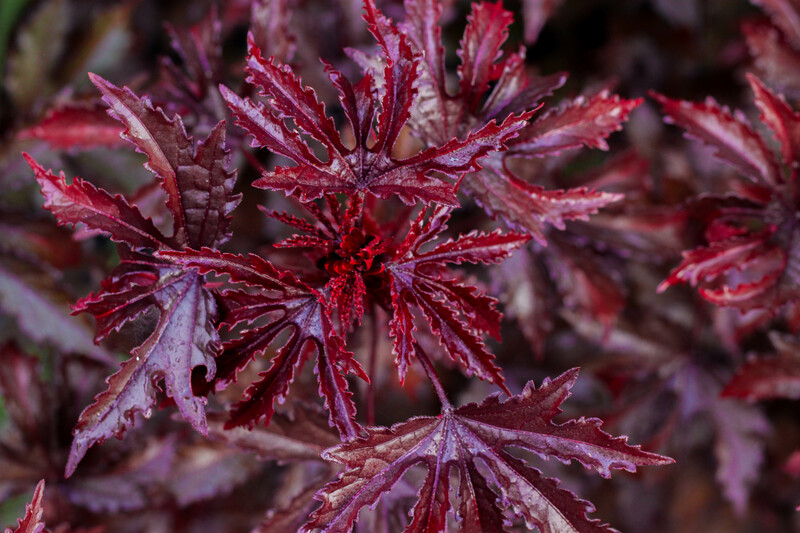 This Mahogany Splendor variety of Red-Leaf Hibiscus has a really beautiful deep maroon/mahogany tone that is nice to have over the summer to help add contrast to the beautiful pastels and cream colors of summer flowers. It will also be a beautiful addition to the fall line-up of Chrysanthemums that will bloom starting late September and into November. At first I wasn’t a fan of this foliage because when it was younger, it seemed to wilt very quickly after being cut. Now that it’s more established and growing taller and stronger each day, it seems to do well as long as its cut in those cooler early morning, late day hours. The shape of its leaves are similar to a maple leaf and add a really nice delicate, lacey dimension to its sturdy presence. We grow it for this lovely foliage but it also makes a flower later in the fall. I can’t wait to see the flower it makes and to find out how it will do as a cut flower. In warmer climates, this can be treated as a perennial and can last 3+ years. In our grow zone, it is an annual and will die as soon as the frost hits this fall. Next up is a really special grass that is also popular among floral designers right now. 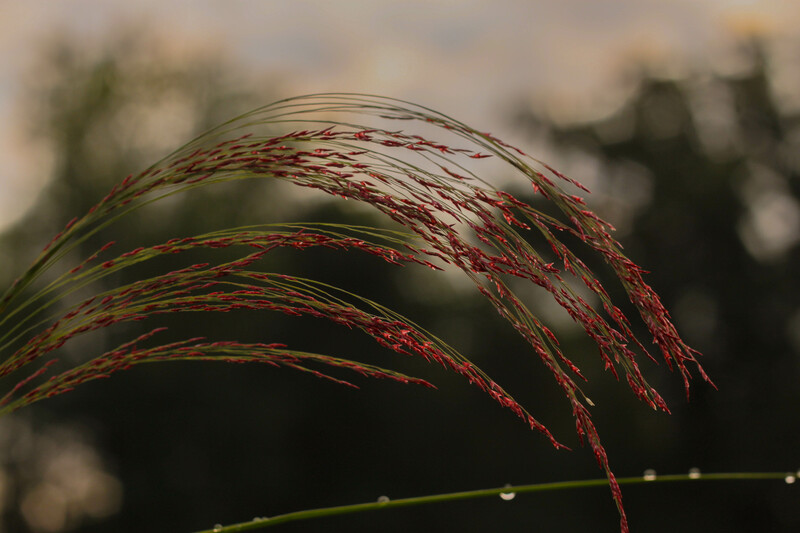 It’s common name is Ruby Silk Grass and it’s scientific name is Eragrostis Tef. (which is a fun collection of syllables to say all at once.) There’s also a golden/green variety of Eragrostis Tef, but the Ruby Silk is so special because it seems to glimmer in the light. This grass is high in nutrition (fiber, protein, calcium) and in some areas of the world it is grown as a grain and used like rice or millet. It is native to Ethiopia and is one of the ingredients in the spongy bread, injera. 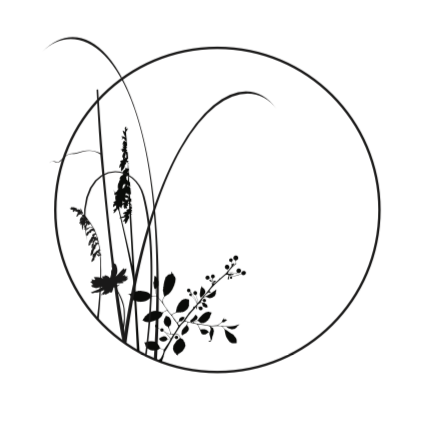 When I looked at the wikipedia description of Eragrostis Tef, one of the sentences that stood out to me the most that I wanted to share was this: “Eragrostis tef is adapted to environments ranging from drought stress to waterlogged soil conditions. Maximum teff production occurs at altitudes of 1,800 to 2,100 m, growing season rainfall of 450 to 550 mm, and a temperature range of 10 to 27 °C.” Mostly I like the fact that “maximum teff production” is a thing and also that it’s a seemingly adaptable and nutritional grass, which is pretty awesome. Apparently, it’s also just pretty to look at, so flower farmers grow it and floral designers buy it here in the United States. I’ve been hearing some good feedback that some of your flowers are lasting past a week! That’s really great! If you feel up to it, go ahead and pull out the sturdy stems that still look good from last week’s bouquet, cut off any of the stem that looks like it may be rotting from being in water that whole time, and make a shorter, mini-bouquet to go in a tiny vase or cup. You could even take this smaller, “recycled” bouquet to that barbecue or party you’re going to this week because in my experience, people respond positively to the person who brings beautiful, fresh flowers into their space. Enjoy your blooms this week!